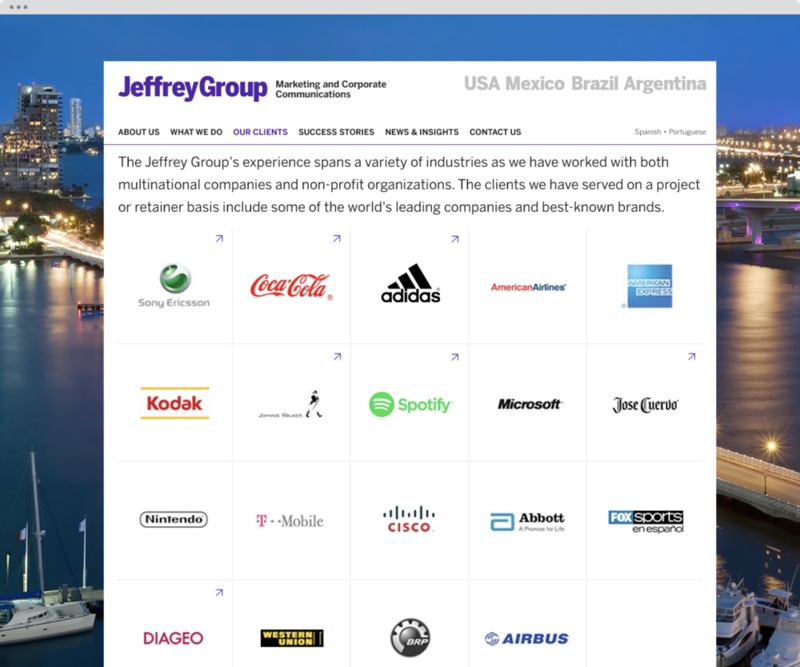 JeffreyGroup is Latin America’s largest independent Public Relations agency with offices in 7 locations throughout the Americas. They have created award-winning campaigns and manage the public relations for Fortune 500 companies. We were tasked with implementing the first rebrand in JeffreyGroup's 20 year history, working alongside Conway+Partners New York. The website makes use of a box system with varying column layouts. A 2 column grid (2:1 width ratio) was used for the landing page, a 3 column grid was used for infomation and contact pages, and a 5 column grid displays the company logos corresponding to the success stories. The three-box footer cycles through blog content, client list and recent agency news. The landing page uses a dynamic display system to cycle through the most recent and relevant content. The challenge here was creating a flexible CMS that enables the 7 different offices to remotely manage their web content on the back-end, while displaying their specific content in their corresponding language to the viewer, based on the viewer's location.